All are invited to TEMV’s Annual Community Passover Seder on Saturday, April 15, 2017. If you have never been to TEMV, this is the perfect time to join us! 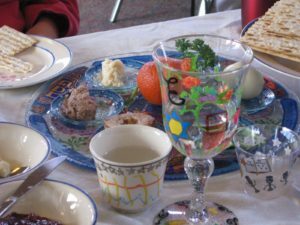 Come celebrate with us at this pot luck seder led by Rabbi Robin Sparr. Families are encouraged to bring their children and to invite friends from near and far! Our Seder promises to be meaningful as well as fun! Time and date: Saturday, April 15, 2017, 5:00 p.m.
Each family is asked to bring two dishes that serve 8 to 10 people. Reservations are required. Please email seder@temv.org by April 10, 2017. We hope to see you there!